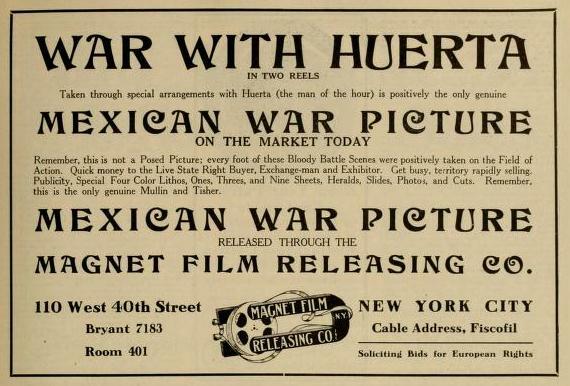 There was expected in New York City, Wednesday, May 27th, the original negative of “War with Huerta,” the sensational Mexican War feature which Mullin & Tisher are selling throughout the country, through the Magnet Film Releasing Company, Room No. 401 World’s Tower Building. With the original negative were expected the first five prints which have been made. Shipment of prints to the many energetic exhibitors and state’s right men throughout the country who have purchased the feature was expected to begin on Thursday. Additional prints, at the rate of ten or twelve per day, are to be made in New York City to satisfy the big demand which has sprung up. “War with Huerta” is in two parts and in the aggregate measures a little more than 2,000 feet. 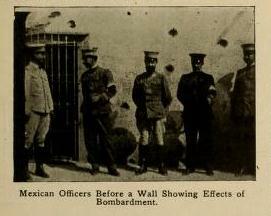 It is just what the most literal interpretation of the title would indicate, namely, “war.” as it is now being waged between the Federals and the Constitutionalists in the adjoining republic of Mexico, shown after extended trooping “with Huerta,” the Mexican dictator— “The Man of the Iron Mask”—whose failing power has been filling the newspapers for months and whose flight from Mexico City to seek refuge in Europe is rumored from day to day. The picture will impress all who see it with its authenticity. If animated photographic views falsely purporting to represent the lively happenings in Mexico during the past few weeks are being shown, this is not one of them. It is claimed for the feature that it shows actual warfare between the Federals and the Constitutionalists outside of Torreon, and one has only to see the pictures to know that the claim is a just one. While the photography is clear enough to enable one to follow the sequence of event?, it may be said that the feature carries conviction of its genuineness largely because of the fact that the public is not asked to believe that the cameraman did what they regard as the impossible in making his exposures. 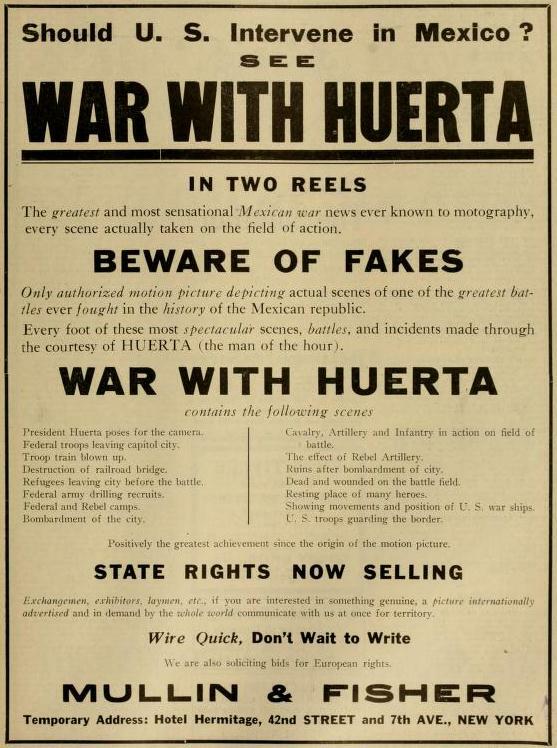 “War with Huerta” purports to be a topical release deriving its principal interest from the daily newspaper reports of the Mexican situation and calculated to provide those who witness it with a better understanding of existing conditions in the territory for the control of which the Federals and the Constitutionalists have been battling so long. In this sense, too, the offering is certain to prove a big success. The picture is in two parts and logically opens with an easily deciphered map of the Republic of Mexico with the various cities prominently mentioned in the news dispatches from day to day plainly marked. Next, there is presented a close-up picture of Huerta, and immediately following reproduction of the spirit which was issued to the cameraman who trooped with the Federals for months to film the incidents which have been chosen. The strength of the Federal forces and the character of the men, both privates and officers, who have been so staunch in their defense of the Huerta regime is next set worth in pictures of a review of the Federal troops in the crowded streets of Mexico City. The ravages of war are next indicated with pictures of one of the big railway bridges destroyed, showing one of its spans gnarled and twisted as it lies in the bed of the river which it was built to cross; the debris of a train blown up by one of the warring factions is also pictured. Following scenes showing the arrival of Federal troops at the front, Federal recruits at drill. Federal troops in camp, and Constitutionalists in camp and on outpost duty, the second part of the feature takes up the defense of Torreon as vainly made by Huerta’s soldiers. The Federal artillery in action is shown at close range and later the advance of the Constitutionalist forces is plainly recorded, the pictures showing the systematic firing of the Villa forces and the bursting of Federal shells above their heads. These battle scenes have quite evidently been taken at considerable distance from the subject, but they are remarkably convincing and are lacking in none of the detail required to prove that the pictures were made while the engagement was in progress. The ruins of Torreon after the battle, a battlefield strewn with Mexican dead, and the rough graves in which the dead were hastily buried are also shown before there comes the switch to a series of interesting views which show the activities of the United States troops, both land and water, along the Mexican border. J. M. Mullin, who secured the feature, purchased the negative from a free-lance cameraman named Frank Jones, who has been operating out of Los Angeles for a number of years. Mr. Jones, who speaks the Mexican lingo like a native, spent several months with the Federals and built up a friendship with Huerta which proved quite valuable. As it is being offered state’s rights buyers to-day, the two-reel release is a condensation of approximately 5.000 feet of negative which Mr. Jones secured. New Yorkers will remember Mr. Mullin as having conducted the United Film Rental Company on Twenty-third Street, New York, a few years ago. His Mullin Film Service, with headquarters in Syracuse and branch offices in eight other cities, was a more important enterprise. Leaving the eat Mr. Mullin engaged in the film business in Denver, Butte, Mont., and Portland, Ore., before locating in Los Angeles, Cal., where he had been for some time before coming on to New York with the Mexican war feature. It is announced at the Mullin & Tisher officers that exhibiting rights in seventeen states of the Union have already been disposed of despite the fact that not a print has been shipped. The feature is being offered on a particularly liberal plan with the idea of interesting in special feature service a class of exhibitors who have not purchased “exclusives” before. La misma revista en su sección dedicada a los exhibidores menciona a varios de ellos que han reservado la cinta al grado de que uno decidió subir el precio de entrada a 15 y 25 centavos, cantidad jamás cobrada en Monticello, Kentucky. La cinta fue un verdadero éxito entre el público norteamericano. 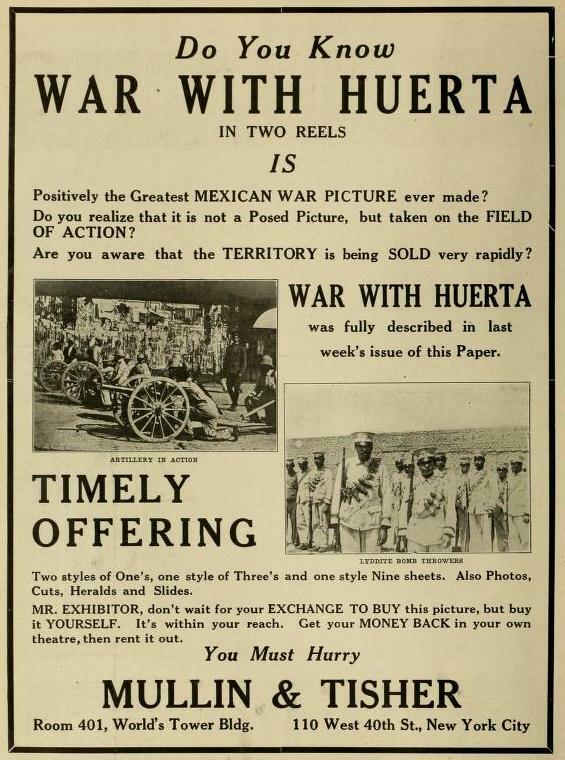 L. J. Dittmar, of the Majestic Amusement Company, Louisville, J. Johnson Musselman and Fred Sheldon of the Warner Feature Film Company of the city, recently purchased the Mexican war film known as “War with Huerta,” and have the state rights for Indiana and Kentucky. A special company has been formed, known as the Mexican War Film Company, for the sole purpose of booking the reel. It is not incorporated. Practically every house in Louisville has shown it and arrangements are now being made in Indiana by Musselman. C. W. Simmons, manager of the Gem Theater, of Monticello, has booked the feature “War with Huerta” for July 25. Admission prices will be raised to fifteen and twenty-five cents, the largest prices ever asked at Monticello. C. P. Davidson, of the Lyceum Theater, of Middlesboro, has booked the same feature for July 28 and he will also raise his prices. The Mexican War Feature Film Company, of Louisville, is more than satisfied with the results obtained with the big war feature. A México llegó también un camarógrafo free lance llamado Frank Jones, sin las dotes periodísticas de su colega alemán [Fritz Arno Wagner]. Sin embargo, regresó a Estados Unidos con más de 5,000 pies de negativo. Esto dio como resultado, en mayo de 1914, un documental que se anunciaba de la siguiente manera: “¿Deberá intervenir Estados Unidos en México? Vea Guerra con Huerta“. Se presenta un mapa de México mostrando claramente las ciudades mencionadas por la prensa norteamericana día a día. El presidente Huerta frente a la cámara. Revisión de las tropas federales en la ciudad de México. Un tren militar en ruinas después de ser bombardeado. Destrucción de un puente ferroviario. Refugiados abandonando Torreón antes de la batalla. Llegada de las tropas federales al frente. Los federales ejercitando a la leva. La segunda parte muestra la defensa de Torreón por los federales. La artillería, la caballería y la infantería en acción. Avance de las fuerzas constitucionalistas. Los efectos de la artillería rebelde. Las ruinas de la ciudad. Muertos y heridos en el campo de batalla. Tumbas en las que serán enterrados los cadáveres. Las pésimas relaciones del gobierno de Wilson con el de Huerta no impidieron que la firma Mullin & Fischer (sic) de Nueva York presentara en mayo de 1914 su corto documental War with Huerta como filmado “por cortesía de HUERTA, el hombre de la hora”. (Una pista quizá no ociosa: Fischer (sic) es un apellido alemán.) Así, según la publicidad de la cinta, ésta debía verse como la “única autorizada” entre las que mostraban la situación mexicana; “BEWARE OF FAKES” (“cuidado con las falsificaciones”), se advertía, aludiendo quizá a ciertas batallas mexicanas filmadas por la Mutual de California, como se verá.